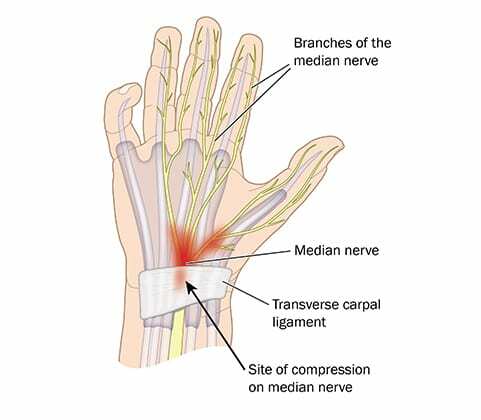 Carpal Tunnel Syndrome (CTS) refers to a painful problem in the hand and wrist caused by damage to or pressure on the median nerve. CTS is fairly common, affecting about 3-5% of the population. Women have CTS more often than men. Pregnancy and obesity, as well as diseases such as diabetes, hypothyroidism, and arthritis, increase the risk of getting CTS. Jobs where you repetitively use your fingers, wrists, and hands (i.e. excessive computer use) can also lead to CTS. Symptoms of CTS include numbness or tingling in the fingers or aching pain in the hand and wrist. These problems may get worse at night or when doing certain things like driving or reading. Physical Exam: Dr. Prywes will perform a thorough examination of your hands, wrists, elbows, and shoulders. He may also examine the wrist to determine if holding your hands in a certain way or pressing on the inside part of the wrist causes tingling, pain, or numbness in your hands. Finding out what causes pain or tingling may determine if you have CTS. An EMG/Nerve Conduction Study may be suggested to show how well the nerves are working. Rehab Management: You may have to change how you do things at work or home to take pressure off of your wrists, such as obtaining an ergonomic keyboard or mouse and taking more frequent breaks. Sometimes a splint or hand and wrist exercises can help. If these things do not work, injections of corticosteroids into the wrist or even surgery may be needed.